> To a large degree, the gap between perception and reality on the tax cuts appears to flow from a sustained — and misleading — effort by liberal opponents of the law to brand it as a broad middle-class tax increase. This is dumb. Yes, the middle class got a few dollars back. Why are the super rich and large corporations getting massive tax cuts? That's the real problem here and it's predictable that conservatives are trying to hide behind the fact that the middle class are getting a few more dollars back. Lol, way to miss the point. Typical. Ha! You think it's the same percentages and the rich only got the same percentage back and hence their dollar amounts are larger? First off..... That's not true. But I'm curious... Even if that was true, do you think that the same percentages should be applied across the board? The reality is that “the super rich” by-and-large have very little taxable income and are paying effective rates in the 1X% range. What Trump did with marginal rates will have little to no effect on them. Re: corporate taxes, study an economics text book. There is no such thing. So why is a tax cut good for the continuity of my government and society? Why is this a good decision? I don’t want a few more dollars while I shell out $200 every 6 months to fix my alignment from the potholes. I don’t want a few more dollars if there are people in my society that don’t have food. I don’t want a few more dollars if I don’t want to walk the streets and parks at night because of a homeless epidemic. Sure, the decision to build an interstate highway was made federally and then the maintenance was dumped onto local governments. Does that make sense? Who has better resources to address the problem? Should the local government be allowed to toll an interstate highway? @Oomnj how dare you say that our government doesn't spend wisely?! So to be clear you are saying any pro republican articles or pro trump articles in ny times are not fake news but everything else is ? Typical .. The Koch Brothers’ taxes went down by about $1 billion. Yes, thats the psychological issue that the article refers at the end. Their RATE went down more, so no, it's not a psychological issue. 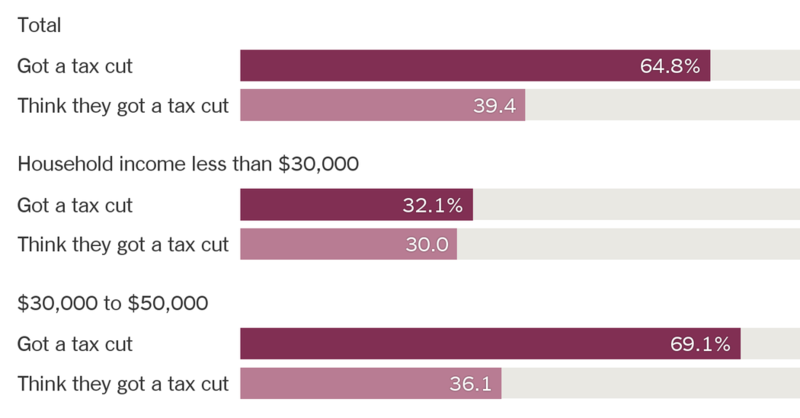 The tax bill primarily benefited the ultra rich. Mainstream media on both sides of the aisle are both guilty of this. There’s no moderate news source any more. Yeah - but you can’t compare random misleading blogs to the NYT, which classified itself as a Pulitzer winning unbiased source of neutral journalism. Mainstream media can only talk subjectively about certain arguments. Do you blindly believe what people tell you ? Just show me the data and I will interpret it myself. tldr; Democrats won the perception war this time. last year’s tax cuts showed up mostly in the form of lower withholding from workers’ paychecks. A few extra dollars in a biweekly paycheck proved easy to miss. Moreover, as taxpayers filed their returns, many found they were due smaller refunds than in the past, which may have further skewed perceptions of the law. Surveys consistently show that what bothers Americans most about the tax system is not that they pay too much but that they think corporations and the wealthy pay too little. Is = is assignment or equality check , if it’s equality is it reference equality or value equality. Is ! Factorial or Not. And is it duck typing, looks like winning, walks like winning, so must be winning. Blackrock, you just had a stack overflow. Please reprogram yourself. This analysis is correct. People don’t care about their withholdings, they care about their tax refunds. While Trump lost out on this one, he probably doesn’t care as long as corporate taxes got cut. The middle class got a few dollars per paycheck, and then many received way less refund or even had to pay with their return. That doesn’t help the economy because this tax bill did not factor in spending habits of the middle class. The folks that received the biggest tax cuts will not be putting that back into the economy soon, because as Warren Buffett says, 1000 people will spend $1,000 more efficiently than 1 person $1,000,000. Moreover, the deficit (and the debt) is getting blown out of the water, and who best to get saddled with that than the GenX-ers and Millennial when they retire? So yeah, this tax bill is batting a 1000 when it comes to tonedeaf, shortsighted economic policy. You’re missing the point. The increased deficit is going to eat those tax cuts for lunch. Personally, my taxes went up. And taxes will go up on the middle class in a few short years, since they had to raise taxes on everyone else to pay for this bill. Not to mention that all of this is on the national credit card, adding $200 billion to the deficit every year. Even worse, we got almost no long-term sustainable investments from this tax bill. Nor did employees get much of anything. It almost all went to stock buybacks, artificially inflating the market. Worst of all, we are massively building up the deficit while the economy is booming. What will you do when it tanks? But according to OP, since the middle class is temporarily getting a few dollars back, this was a brilliant move. Where is fake news? What is fake exactly? What is news? I'll do you one better: Why is news? You debunked yourself in your post. That’s hard to do. Congrats. Tax cut is a fake news. It's a tax hike, where people need to pay taxes on taxes now. Not a single socialist came up with this. We now have a gaping hole in the budget and national debt is exploding. All the money are going to the welfare programs for military contractors. Nobody is entitled for a fake job at some military contractor. Yes, so maybe the story is that Breitbart lies. Even the article that complains doesn't link to any instances of this. That's been the common talking point here. The ignorance among seemingly smart people is astounding. I am not rich but did not get a tax cut due to SALT limitations. I guess it’s all how you define middle class and rich. Will you support Andrew Yang?